I had my eye on this one every since Nymth reviewed it earlier this summer. Then I saw the trailer for the movie and knew I wanted to read it before the movie was released. The book itself is quite unique; it combines the novel with a picture book and scenes from old French movies. Even though it's over 500 pages, it's actually a fast read because pages alternate from traditional text to illustrations. 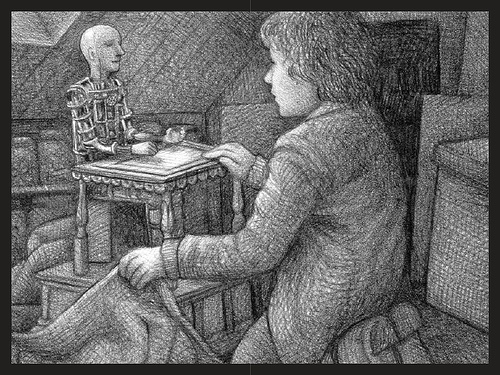 Each do their part to tell the story of Hugo Cabret, an orphaned boy who lives in the walls of a Parisian train station, winding the station's clocks every night and working to fix a broken automaton, which he believes holds a message from his deceased father. What interested me most about this book was not Hugo himself, but the way it paid homage to early 20th century French film. I went abroad to study French film in college, so I found the references to the films and filmmakers most captivating. The novel really captures the magic and excitement that early film evoked. Further, Selznick's illustrations are placed carefully within the book so that when the reader turns the pages, they almost read like a black and white movie. The arrangement of pages and the act of turning them are significant to the telling of the narrative. While I wasn't completely blown away by the overall plot, the medium of the book is so innovative, I think this one is worth checking out. In a related note, Martin Scorsese directed the film "Hugo", based on this novel. It looks like it has the potential to be awesome. You can watch the trailer here. It was definitely the medium of the book that hooked me. The drawings were beautiful! I ordered this book last week. I somehow missed hearing about it before the movie came out. I can't wait to get to it. I didn't realize that it was a unique medium. Now I'm even more excited to get to it! My favourite thing about the book was also how well it captured the magic and excitement of early cinema. Very curious to watch Hugo! I think your review helps me clear up my confusion about why Scorcese decided to direct an adaptation. Studying film abroad sounds pretty awesome as well. I am hoping to read both this and Wonderstruck ASAP! I loved this book, and like you, the connection to film truly fascinated me. I may have to re-read this before seeing the film. i was pretty excited when i learned that this was the first novel to win the caldecott award. i'm a huge fan of the book awards, particularly for the younger literature. love this book and love selznick. 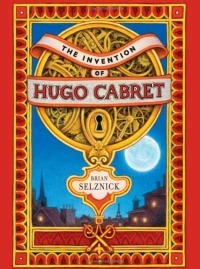 I taught a Lit and Film class last term, and while we didn't have time to read The Invention of Hugo Cabret, we did discuss Melies, watched some of his films, and we watched the trailer for the Hugo film to see what visual connections we could make. I loved the book and think Selznick's illustrations are just stunning. Can't wait to read his second book. Ever since I saw the movie preview I was anxious to get to the book ASAP. I hope to begin the read next week. It sounds very unique and I can't wait to get started!